Thomas Tuchel, the Paris Saint-Germain coach, has told 'RMC Sport' that the French champions won't let Adrien Rabiot leave easily. Rabiot, who is out of contract next summer and is free to negotiate with clubs from January, has still not agreed a renewal with PSG and his future looks to be away from the club. Barcelona are not the only team interested. Juventus, Manchester City and Liverpool have also been linked with the French midfielder. 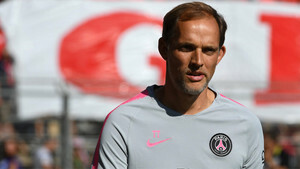 However, Tuchel insisted that the player features in his plans still: "Honestly, I really like Adrien. He had a difficult situation missing the World Cup voluntarily (he didn't want to be a standby), but his predisposition with the team has been first class. He's not missed a training session." According to Tuchel, Rabiot "can adapt to any system and is if he's fit he's essential for our plans. He has huge potential and is a player that's developed at the club. It's really important we have players like him." Barça tried to sign him in the summer but PSG refused to negotiate, despite his situation, which has seen Barça also look into Frenkie De Jong (Ajax) and Paul Pogba (Manchester United). It's well known that PSG aren't a selling club and that the usually respond to interest in their players by making moves for other players at the interested club.